EY's audit to the Portuguese public bank, CGD, revealed that the bank lent money to bad debtors, a decision which goes against the credit concession rules. The audit is being debated in parliament. EY’s audit to the Portuguese public bank, Caixa Geral de Depósitos (CGD), has revealed that the bank lent money to bad debtors, a decision which goes against the credit concession rules. This Thursday, the results of the audit are being debated in parliament. According to EY’s report, to which ECO had access, between 2007 and 2012 the public bank granted credit to bad debtors — and despite that not being such a surprise, the report shows that 7% of these decisions were made regardless of the opinion of the risk analysis team, which had advised against it, and those steps were also given without any justifications being given for those credit concession. The report analysed the top 200 debtors, in the period between 2000 and 2015, and the audit explained that there were many credit concession operations which were considered “unfavourable” by the Risk Assessment Team of the bank, or risky, but yet were approved, without any justification, by the bank’s managers. Despite the fact that the audit was analysing the period between 2000-2015, this phenomenon only occurred between 2007 and 2012, during which term Carlos Santos Ferreira and Fernando Faria de Oliveira were heading the public bank. The audit was requested by the Portuguese minister of Finances, Mário Centeno, in 2016, and in 2017 CGD welcomed a financial rescue of €3.944 bn from the government. 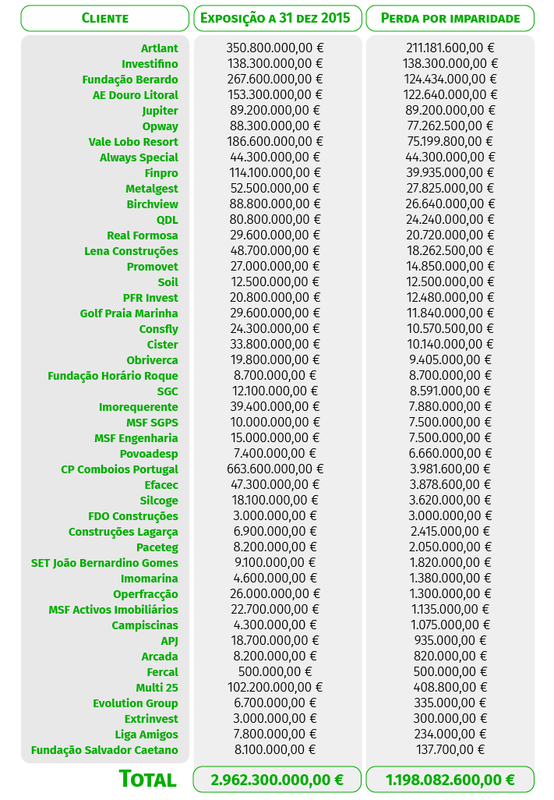 Lusa, the Portuguese news agency, contacted a representant of the European Commission to understand what could be the turnout this could have on the European level, but the EC representative claimed that they would prefer to highlight the progress achieved by the Portuguese financial system, rather than looking at the conclusions of EY’s audit to CGD, also adding that “the Commission does not comment on isolated cases, in this case of one Portuguese bank, but rather comments on the efficiency of the banking system as a whole”. He also noted that “during the recent years, the evolution has been positive, especially when it comes to reducing the non-performing loans and improving the operational efficiency”. “Despite the fact that there is still a lot of groundwork to do, the overall assets quality improved, and the NPL ratio reduced substantially”, the Commission’s spokesman added. This Wednesday, the vice-governor of the Bank of Portugal, Elisa Ferreira (who was one of the favourites for ECB’s supervisory body leadership but decided to not present her application in August) announced that the banking regulator was taking every step necessary in order to assert “the results of EY’s audit to CGD” which was already delivered to the BdP a long time ago, she added. “We processed the audit, read it, interpreted it, and now we are using every part which is connected with the supervising responsibilities of the BdP. This institution is taking into account, as a supervisory agent, all the relevant conclusions presented to us on EY’s final report”, she said. The European Central Bank (ECB) also refused to comment on the CGD’s specific case, when contacted by LUSA. The public bank has admitted to losses which reach almost €1.2BN, with a total of 46 operations that went wrong, transactions which did not respect the banking regulations for credit concession. During these years, the administration of the bank ignored the continuous warnings issued by the bank’s competent bodies and approved operations which did not present the necessary credit guarantees, and which had been considered of “high or severe” risk. In total, the impairment losses caused by all these clients reached nearly €1.2 BN. Each of these transactions occurred between 2000 and 2015, but EY does not reveal in which exact date these were granted, nor does it reveal the initial amount granted to each of these clients. At a time when the government admits the country is entering a "new economic cycle", highlighting its capacity to grow above the EU's pace, Fitch forwards warnings on the country's performance.